About Time reminded me of two truths about my life. The first truth has been a core part of my personality since my earliest memories. I love science. I find physics and cosmology fascinating. Adam Frank is a professor at the University of Rochester and a commentator on science and cosmology for NPR. He is known for taking deep subjects and putting connective tissue on them so that non-scientists can appreciate and relate to the astounding discoveries being announced by CERN and other high-powered labs and leaders in various fields. About Time tries to do this as well. Frank looks at time in both practical and scientific terms. It is easy to forget in our always connected, always clock-aware culture that timekeeping is itself a relatively new invention. Sundials and general awareness of the passing of time go back centuries, even millennia, as natural phenomena follow rhythms set by the passing of days and seasons. As humans began agricultural pursuits, awareness of times to plant and harvest became important. People responsible for marking time’s passage also became important, as planting too early or harvesting too late could lead to catastrophe. As urbanization eventually led to manufacturing the marking of smaller increments of time became important. Another often forgotten reason for the “invention” of time (or at least more accurate time-keeping means) was the need for accuracy in measuring distance. Time and distance are related, as we may vaguely remember from early algebra (rate x time = distance) and the always invigorating word problems: if Sally is on a train traveling west at 60 mph from New York and Johnny is on a train traveling east at 70 mph from Chicago, and both trains leave at the same time, when will you crumple up your homework and throw your book against the wall and burst into tears? (I have painful memories of many math classes, so my apologies for the cathartic outburst.) Much more dire than my painful memories is the fact that incorrect longitude leads directly to maritime catastrophe, and longitude is essentially a measure of time/distance from a fixed point. Accurate time keeping leads to accurate location and that leads directly to ships not sinking. Travel on land also required accurate timekeeping. Railroads tied the burgeoning US together, and the need for accurate schedules led directly to the creation of time zones. Although the US led the way in this, the rest of the world quickly followed for the same logical reasons. As telegraph, telephone, radio, and television allowed vast distances to experience the same “now,” our reliance on accurate timekeeping increased. I did not appreciate how grounded in the practical world Einstein’s relativity was. His job at the patent office was to evaluate patents dealing with accurate measurements of time. Swiss clocks were expected to be accurate and technology increasingly required them to be both accurate and synchronized. Einstein’s job required him to think about time and timekeeping–then at night he worked on the equations that eventually became the Theory of Relativity. Instead of time being fixed and universal, Einstein realized that time was fluid and changed depending on perspective, gravity, rate of motion, and other variables. The universe is not set to a cosmic clock. The experience of time changes as one approaches light speed, and even incremental changes are measurable. Clocks synchronized and then placed at sea level and at high altitude will eventually show different times simply because the rotation of the earth is marginally different depending on how close one is to the earth’s center. Einstein dealt with the practical aspects of measuring time. We may never know how much that practical experience influenced his thinking about the scientific aspects of time/space/relativity, but the duality of his life must have had some effect. The main thrust of Frank’s book is on the Big Bang. The Big Bang theory has many problems with it. The obvious one is, “What came before?” So far there has been no adequate answer scientifically or mathematically proposed. However, no adequate replacement has yet been posited, either. Frank looks at several, including string theory and “banes,” but admits in the end that although Big Bang can no longer be considered as settled science (he offers no opinions on it’s role in television sitcom history) there is no other theory ready to take its place. 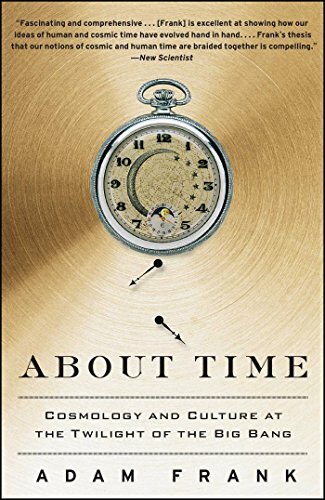 I started this review by noting that About Time reminded me of two truths about my life. The first was of my love for and fascination with science. Frank is a terrific writer. The book is full of interesting anecdotes, scientific history, and changes in culture prompted by science as well as changes in science prompted by culture. About Time reminded me of a second truth as well: I am not a scientist. I will confess, this is not an easy book to read. I was often lost and confused, which I fear is much more reflective upon the reader than on the writer. If you have a strong background and interest in science, especially in astrophysics and cosmology, then this is a terrific book. If you struggle with occasional terrifying flashbacks of 8th grade algebra, then this may not be the best addition to your library. An extremely adept younger reader would find it challenging and a great read, so if you have a young person interested in a career in the sciences, then About Time might be just in time to push her or him in that direction.